Earlier this year we released a report on the status of our PDXG QSL Management Platform that was designed to automate the QSL manager’s back end processes. Developed over the past 3 years it’s now at Version 4.3 and installed on servers in the United Kingdom and the USA. Exclusive users are Tim M0URX, Charles M0OXO, Pista HA5AO and Gene K5GS. The development goal of this collaborative effort was to eliminate, or greatly reduce, a manager’s manual tasks. The first large implementation was the 2015 TX3X Chesterfield Island DX-pedition, we learned a lot about what QSL managers and users expect from an OQRS platform. The application eliminates most of the manual drudgery of processing confirmations for a single DX operator to the largest DX-pedition. A QSL manager with one helper can process OQRS requests for the largest DX-pedition in one day, an amazing 75% reduction in time and labor. Compare this to the old process that took multiple people many days to handle a large DX-pedition. Today the only time consuming OQRS confirmation tasks are stuffing envelopes and affixing labels, a bulk mail franking machine eliminated postage stamps. Other automated tasks include matching donors to the log for special handling and busted call management, no more busted/missing call e-mails. A new feature controls sending duplicate QSL cards to the same DXer. Many DXers request a card through OQRS or Direct and also send a buro card. The software will not respond to the buro request if a card was previously sent for the same contact(s). With all this extra time on their hands M0URX and M0OXO are available to handle additional DX call signs and DX-peditions. For additional information about the project please contact any of the people named in the article at their QRZ.com e-mail address. With computers well entrenched in DXing and amateur radio in general the underappreciated QSL managers that work in the background are the recipients of thousands of e-mails (mostly all inquiring - sometimes complaining - about one or more missing QSOs), an untold number of snail mail pieces containing even more snail mail pieces, currency, IRCs, postage stamps and one or more QSL cards, even some with QSL cards for multiple DX stations or DX operators. This avalanche of paper is time consuming and labor intensive, sometimes requiring teams of volunteers to process. Add to this the hundreds of DX logs (in various formats), millions of DX contacts, donor lists, and consolidated DX club log submissions, all of which require accurate accounting and more importantly preservation. QSL managers use different methods to recover their operating costs which include items such as toner, labels, envelops, and sometimes pizza lunches for the volunteer teams. Some managers personally absorb the cost while others pass the cost to the DX-pedition. In late 2014 Pista HA5AO and Gene K5GS began discussing an OQRS / QSL management platform specifically for the QSL managers that handle our projects. While Michael Wells G7VJR ClubLog is an outstanding application which made significant positive contributions to the hobby and introduced many new concepts in confirming contacts, we were looking for something that addressed the backend QSL management processes. The complexities of handling tens of thousands of QSL cards, e-mails, Not in Log / busted calls requests, returned postal mail pieces and a host of other tasks which were done manually for so many years needed to change. We began by collecting requirements and creating detailed process flowcharts. Pista coded the application and we soon had a skeleton platform that offered some flexibility as well as functionality. The usual and familiar DX Log Search and OQRS functions were delivered in Phase 1. After a number of enhancements and tests we switched it on for the 2015 TX3X DX-pedition. Of course, no amount of testing will uncover every bug. We learned what users expect and how they use OQRS software. Realizing we needed input from people with more experience than either of us in handing large volumes of confirmation requests we contacted Tim Beaumont M0URX (who previously handled cards for us) and his QSL Manager partner Charles Wilmott M0OXO. After e-mails and Skype conference calls we had a comprehensive list of process steps, additional requirements and a written agreement on how to proceed. As the new requirements were sorted, prioritized and coded each was tested by the team. Tim M0URX was our QSL consultant for TX3X, he already had access and experience with the Phase 1 software. We entered into an exclusive partnership agreement with Tim and Charles for full access and use of the new software. We began adding additional features to create a platform that would dramatically reduce the amount of time they were spending on QSL management. As features were added the code was tested to ensure we didn’t break anything along the way and to verify the new feature worked as designed. With their confidence in the software growing day by day Tim and Charles uploaded the logs for all the DX-peditions and DX stations they manage, an amazing 3 – 4 million QSOs from hundreds of DX call signs are now spinning in the cloud. The only people with access to these logs are Tim and Charles, who back each other up. Pista and I have no credentials for their systems. Being cloud based we can have different people handle QSL tasks from anywhere in the world, no need for travel or pizza parties. For example, after TX3X I handled “Not in Log” and “Busted Calls” from New Caledonia, New Zealand and the USA while Tim printed labels, affixed postage, shipped cards and uploaded LoTW from the United Kingdom. One cool DX-pedition feature is an interface between the pre-departure donor databases and the station log which allows early donors receive LoTW uploads as they worked us (from the island). When a DXer makes a donation OQRS sets the LoTW flag for that QSO. Subsequent QSOs by that DXer will also be processed by the LoTW routine. Similar function was included to handle all donors of any amount, with flexibility to segment donors by preset dollar amounts, i.e. free QSL cards and/or early LoTW for a predetermined donation amount. Before this automation the QSL manager spent many hours typing call signs and e-mail addresses. With just a few software bugs (mostly cosmetic) through the 3rd quarter of 2016 a number of new feature / functions were added in the 4th quarter to automate log handling from DX clubs and foundations (mainly in EU) and greatly improving data base response time. Now at Version 4.1; Tim and Charles report over a 50% reduction in time and labor from their previous mode of operation. QSL managers for large DX-peditions typically get hundreds if not thousands of e-mails from DXers asking about Not in Log / Busted Call situations. Some DXers send multiple e-mails to different e-mail addresses with long explanations asking for help. While I know they’re trying to be helpful, reading these unformatted explanations is a slow and painful process. The reader must ferret out the QSO details and usually write them on a pad. When a DXer can’t find his/her call in our system they will complete an integrated form that’s sent to the QSL manager’s work queue. Only one form is accepted per call sign thus eliminating repetitive requests to research the same missing Qs again and again for the same individual. The now familiar OQRS Bureau card request function eliminates the need for a DXer to send us their card via the Bureau, saving more time, cost and paper. Even though we still accept bureau cards I’m sure everyone knows we don’t need or want your card via the bureau; they all end up in the recycle bin, which is a waste of everyone’s money. To be clear, we (and most DX-peditions) do provide free bureau cards but prefer the request via OQRS. At this writing we believe we have covered all the major processes that needed to be automated and will enter a quiet period for major enhancements. Minor changes will be made regularly as well bug and cosmetic fixes. Not unlike the automation of any manual process in the business world, standards were developed and tested. We have processes and filters to upload DX-pedition logs in the required format. 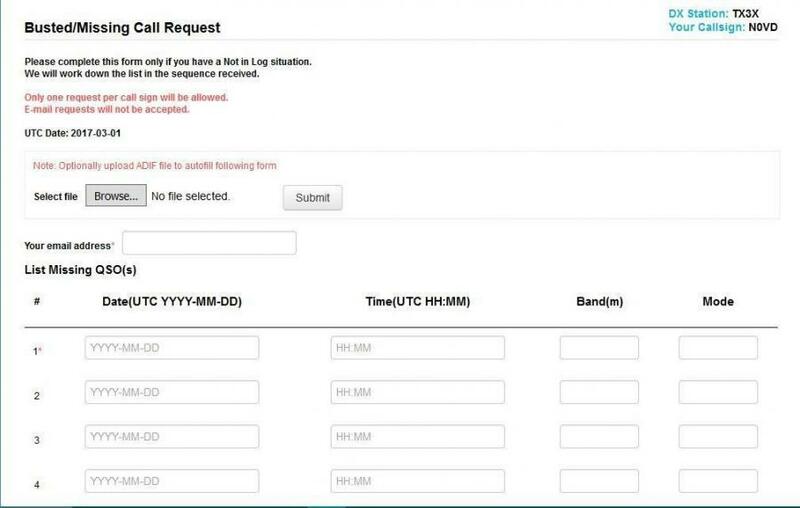 DX clubs submitting consolidated logs will convert their submission beforehand, relieving the QSL manager of manual tasks. We notified the affected clubs / foundations of the changes and will create an instructional document that explains the new process. From the perspective of the typical DXer the platform’s user interface is seamless, familiar and intuitive. During 2017 we’ll consolidate, prioritize and budget any new requirements. Bugs, regardless of severity, will be addressed as they materialize. There are many amateur radio operators in the IT profession, and we all think we understand how QSLing works. 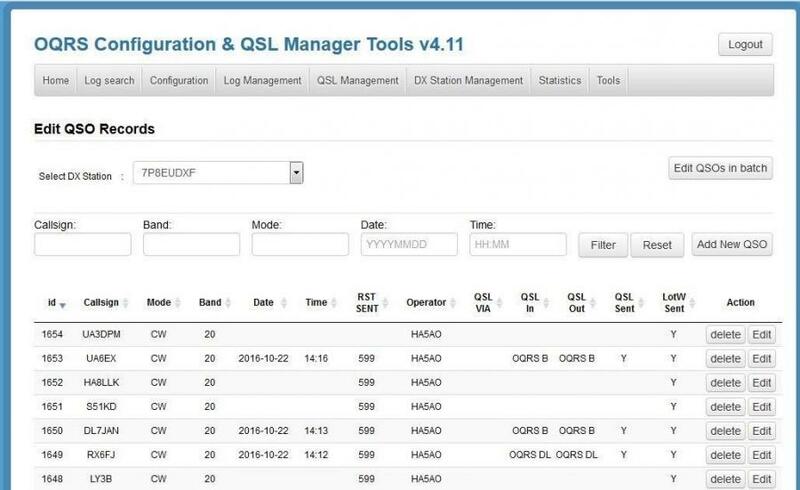 Until you document the many permutations of the end to end QSL / OQRS management process you realize very quickly there are very few people that understand it well enough to design a comprehensive software application. Virtually all of the time, work and cost to build this platform was donated by those named in this article. Those of you that request confirmations from Charles and Tim now know a little bit of what’s happening “behind the veil”. They seamlessly migrated to this new environment without anyone knowing it happened, which in itself is a significant accomplishment. The community owes these gentlemen a hearty round of applause for their commitment to the hobby and QSLing. We appreciate the work performed by the worldwide QSL manager community and we expect others may want to use the system. At this time we’re not prepared to license the software, provide a managed service or implement and manage a support structure, this is our hobby not our business. For the foreseeable future, anyone wishing to take advantage of the platform should contact Tim or Charles. I think the DX community knows Tim and Charles as top tier QSL managers. With their workload now dramatically reduced they are encouraging DX operators and DX-pedition teams that need a QSL manager to contact either of them to discuss requirements. United Radio QSL Bureau was started in 2007 by Max ON5UR and Tim M0URX to provide a one stop shop for all QSLing services. Here are a few of the services that we provide. ON5UR as part of this, sourced and designed a "DXpedition & Contest QSL" in runs of 1k+ cards where the design, card and print quality are better than what is on the market and cheaper too! Figure 2 QSL Managers Busted Call Work Queue. 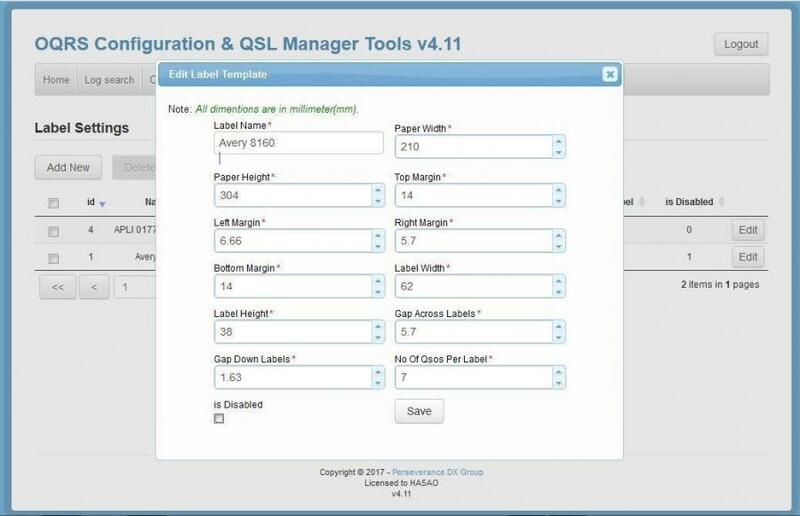 Figure 3 Print Label Configuration Page. Figure 4 QSL Managers QSO Edit Page - Individually or in Batch (unconfirmed QSO information removed).